SHE HELPED IN search and rescue after the Fastnet disaster, went on a resupply mission to South Lebanon and is named after a woman in Irish mythology. But today, after 35 years of service to the Irish State, the LÉ Emer is to be decommissioned in a ceremony in Cork city. 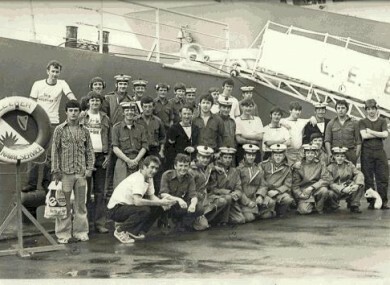 LÉ Emer was the first Naval Service ship to carry out UNIFIL resupply mission in 1979 to South Lebanon, and was involved in the search and rescue operation during the Fastnet disaster off the West Cork coast in 1979. She also played a key role in the seizure of the gun-running fishing vessel “Marita Anne” in 1984. This ship has served her country enormously over the past 35 years and all of her crew, both serving and retired, can be very proud of their hard work and effort throughout her life in the Naval Service. LÉ Emer is the oldest ship in the Naval Service fleet and is one of four vessels that were built in Verolme Cork Dockyard. Since she was commissioned on 16 January 1978, she has had 23 captains and has sailed approximately 518,000 nautical miles – approximately equivalent to the moon and back. Her final Captain is Lieutenant Commander Alan O’Regan, a Cork native, so it is only fitting that the ceremony will take place in Cork today. The name Emer was chosen as it comes from Celtic mythology – Emer was the wife of Cúchulainn and “was known to be a proud and dominant woman”. The flames in the ship’s crest represent the virtues of womanhood, according to the naval service. It was announced earlier this year that both LÉ Emer and LÉ Aoife are to be decommissioned, and that the new ships taking their place will be called after James Joyce and Samuel Beckett. The new names will “facilitate greater recognition of the ships when they visit foreign ports”, according to Minister for Justice Alan Shatter. Email “LÉ Emer to be decommissioned in ceremony today ”. Feedback on “LÉ Emer to be decommissioned in ceremony today ”.